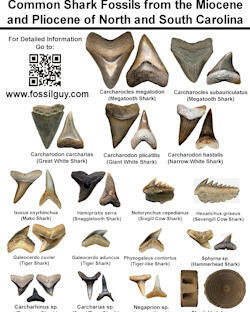 Below are printable fossil identification guide sheets in PDF and JPG format. These are ideal to take fossil hunting with you if you are new to fossils, or taking new people or children with you when you travel to the outdoor fossil sites. Simply click on the corresponding images and save the .PDF or print. 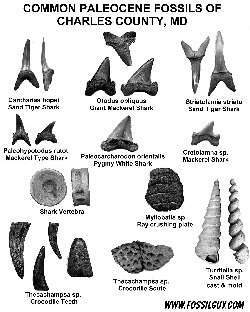 If you don't see the fossil identification guide you are looking for, try looking at the Fossil Hunting Sites . 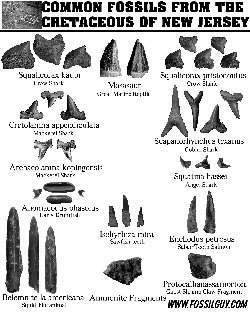 Each fossil hunting location has an online and more indepth identification section. This fossil identification sheet is ideal for identifying vertebrate fossils from the Calvert Cliff area of Maryland and the Horsehead Cliffs of Virginia. It's good for fossil shark teeth identification in this area. This fossil identification sheet is ideal for the invertebrate (i.e. 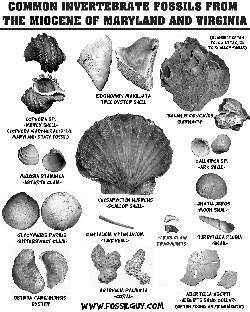 shells) fossils of the Calvert Cliff area of Maryland and the Horsehead Cliffs of Virginia. It's good for fossil shark teeth identification in this area. 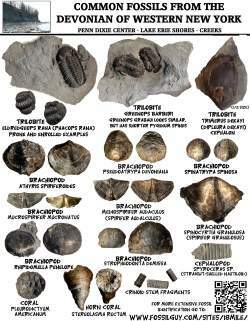 This fossil identification sheet is ideal for the Paleocene outcroppings along the Potomac River in Maryland and Virginia. It's good for fossil shark tooth identification in this area. This fossil identification sheet is ideal for collecting the spoil pile in front of the Aurora Fossil Museum in Aurora, North Carolina. It's good for fossil shark tooth identification in this area. 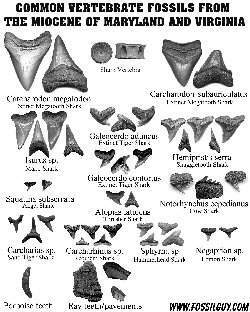 This fossil identification sheet is ideal for collecting at Big Brook in Monmouth County, New Jersey, and nearby Cretaceous places.